According to Dr Peter Macreadie from University of Technology, Sydney, atmospheric CO2 levels are now so high they risk damaging our ecological life-support systems and seagrass could play a vital role in helping reverse the earth's dangerous warming trend. The ability of seagrass to absorb CO2 could be worth as much as USD 45 billion, based on the current carbon price of about USD 23 per tonne. "If the amount of CO2 in the atmosphere reaches 450 parts per million, the Intergovernmental Panel on Climate Change - the world's 'climate change referee' - estimates we will only have a 50 per cent chance of avoiding the drought, famine and widespread species extinction that is expected from a two degree increase in temperature," Macreadie said. "What seagrasses are doing is not complex. They are simply capturing and storing carbon through photosynthesis and by trapping particles in the water column. This process - known as biosequestration - is what created fossil fuels in the first place," he said. Seagrass beds are highly diverse and productive ecosystems, and can harbor hundreds of associated species from all phyla. They are sometimes labeled ecosystem engineers, because they partly create their own habitat. Their leaves slow down water-currents increasing sedimentation, and the seagrass roots and rhizomes stabilize the seabed. Seagrass meadows account for 15% of the ocean’s total carbon storage. Per hectare, it holds twice as much carbon dioxide as rain forests. 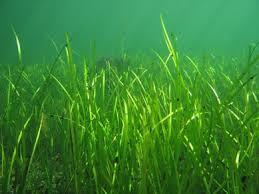 Yearly, seagrasses sequester about 27.4 million tons of CO2. Due to high global warming, some seagrasses are in the verge of extinction – Posidonia oceanica is expected to go extinct, by 2050. This would result in CO2 release which can lead to increase in CO2 in the atmosphere. The most-used methods to protect and restore seagrass meadows include nutrient and pollution reductions, protection using marine protected areas, and restoration using seagrass transplantation.